Over two years ago our tribal police lost their powers in a political battle with Mille Lacs County. After that, our community started to deteriorate at a rapid pace. Just last month there were two homicides and three overdose deaths. I think that brings the death total to around 23 in the past 2+ years. Very difficult circumstances for any community to deal with. But through difficult times comes the best lessons, and therefore, Sober Squad emerged. A group of dedicated, determined and passionate people stepped up and formed together to tilt the future of our reservation away from that cliff. For a long time, there was only two of us out here in community basically going door to door looking for more people to help. Then one person showed up and started their beautiful, compassionate journey in recovery. Then another and another. Slowly over time it began to grow and catch momentum. Then there was 16 of us walking this road together we wanted to get shirts and tossed around names for weeks. We all settled on Sober Squad! We started traveling to other recovery events and bringing anyone willing to roll with us. Word started spreading about us. We started a group chat with everyone involved to help coordinate rides to support groups, treatment, detox, sweat lodges, etc. Holding hands while going through these difficult steps forward is important to us. We’re building a recovery community from scratch so to speak. From there a movement was born. Now we have 170 people in the Sober Squad group chat from all over the state. One time a person needed a ride to treatment from St. Cloud and it just so happened a Sober Squad member was in the area and picked them up. Now we have Sober Squad chapters in St. Cloud, Brainerd, Mille Lacs, Cloquet, Grand Rapids, Hinckley, and Minneapolis. All groups are connected and working together to help the next person reaching out. 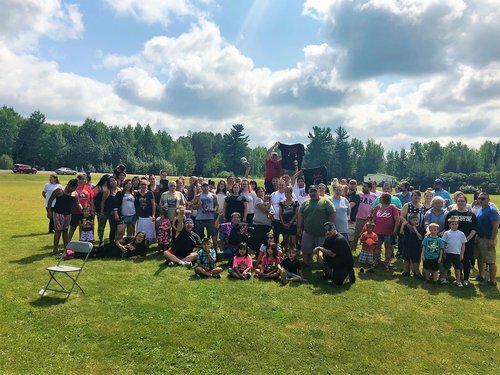 We host a wide range of activities from picnics, sweat lodges, support groups, volleyball tournaments, kickball and smudge walks (walking around the worst part of our reservations burning sage), all to help change the social norms of our reservations and community. We support each chapter with their events and swarm in by the masses! We want to support each individual with all our combined resources and knowledge. Each Chapter has there own Group chat with everyone in recovery from that area to share knowledge and support. Moving forward, the future for Sober Squad is exciting and we hope to reach other reservations and communities in a combined effort and resources. The more our events grow in numbers, the more we can show our communities how strong recovery actually is. It’s an exciting time for recovery and Sober Squad was born in the worst possible environment. But, statistics and numbers are thrown out the window. The only barriers are those that you choose to believe! SQUUUUAAAD!!! Love always, Colin Cash. Recovery Coach trained by the one and only Kris Kelly!!!! !